A shower for the Staab's! 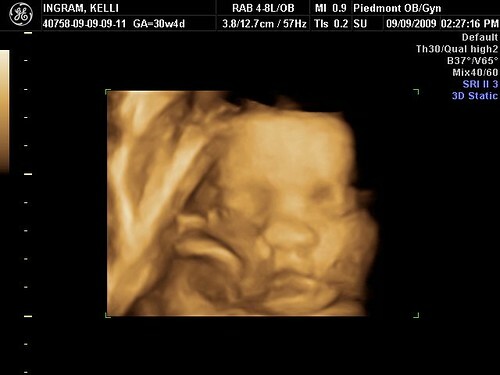 ...Our beautiful little girl...isn't it amazing what technology can do? It is truly surreal to see this picture. The tears started flowing as the tech showed me this sweet little face. I've heard people say that they cried when they saw the heartbeat for the first time, and don't get me wrong, that was SO neat, but being able to see her face and what she looks like was almost more than I could handle!! I'm going to be an emotional wreck (in a good way!) when I hold her for the first time! 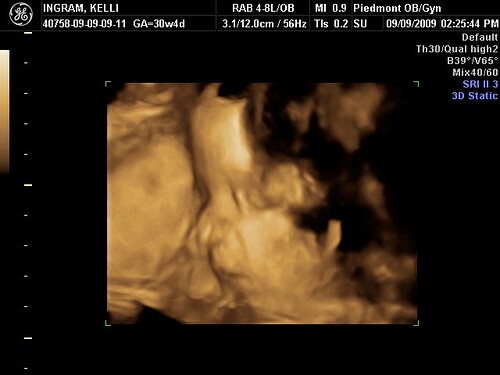 Our ultrasound tech is so sweet, and was as excited to get these pictures as I was. She weighs 3 lbs. 8 oz., she's in the 47th percentile, and she has HAIR!! You can't tell on the 3D picture, but when they were measuring her head the tech pointed out some wisps of hair! Already?! Imagine how long it will be in 9 weeks! I wasn't surprised since I came out with hair almost long enough to braid...sheesh. I will be sure to bring her teeny tiny hair bow to the hospital when she's born!